How do you know how much impression share you have with your PPC campaign? Wish there was a way to find out? There is with Google Adwords Competitive Metrics columns. Search Impression Share - the impressions you’ve received on the Search Network divided by the estimated number of impressions you were eligible to receive. How often your ad is shown depends on your ads' targeting settings, budget, approval statuses, bids, and quality. Search Exact match impression share (IS) - the impressions you've received divided by the estimated number of impressions you were eligible to receive on the Search Network for search terms that matched your keywords exactly (or were close variants of your keyword). How often your ad is shown depends on your ads' targeting settings, approval statuses, bids, and Quality Scores. This metric can identify potential opportunities to capture more exact match impressions and clicks. It’s updated once a day. Search Lost impressions share (rank) - the estimated percentage of impressions on the Search Network that your ads didn't receive due to poor Ad Rank. A high Search Lost IS (rank) means there were many times your ad was eligible to show on the Search Network but didn't because its Ad Rank was too low. Search Lost IS (rank) is updated once a day. If you're seeing a high Search Lost IS (rank), try increasing your bid or improving your Quality Score. If you're not seeing a number at all, it could be because you ran out of budget during this date range. These are some ways you can judge how you stack up against the competition and whether you should increase your budget or capture more impressions with an increase in CPC. Ads for related products will dynamically display in cards alongside retailer's YouTube videos. Google is bringing its product listing ad format to YouTube video ads. The new YouTube ads are the result of an integration with Google Shopping’s technology and is built on the cards platform that YouTube introduced in March 2015. Cards, which will eventually replace annotations, were extended to TrueView ads last month. Cards display as an overlay alongside a video on desktop and tablet and below a video on smartphones. Now, with TrueView for Shopping, retailers can feature related product ads in these cards.The product images and details are passed via the first integration of Google Merchant Center with YouTube. When users click on one of the product ads they are taken to the retailer’s website. Once advertisers link their video campaign with a feed in Merchant Center and set up the cards, products are dynamically added to their in-stream videos based on standard TrueView targeting features including contextual and audience signals such as topic areas, geography and demographics. Does Brand seem to get most of the conversions? Can't figure out why Display performs so poorly? Does your client want to move around budgets based on Google Adwords attribution? Does your client wonder why conversions yesterday look so much lower YoY? 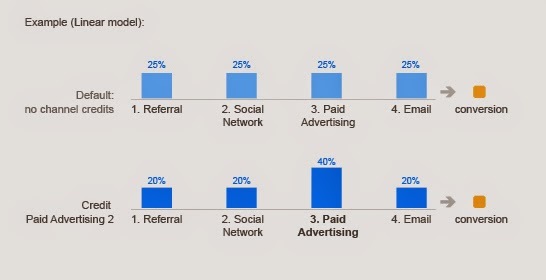 Each PPC platform has a different attribution model. Google Adwords has a "last click" model conversion attribution. This means some conversions can be retro-attributed. For example, someone clicks on an ad 5 days ago and converts today the conversion is attributed to the click 5 days ago. 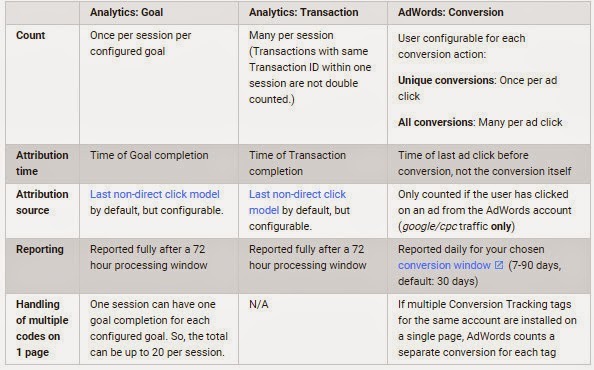 Google Adwords also has a 30 day default conversion window so a click happening up to 30 days ago can be credited with a conversion. This means you have to wait 30 days before all the conversions will be allocated to yesterday's total. 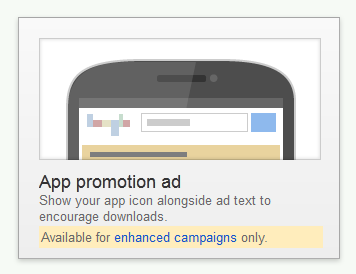 Google Adwords default has a "last non-direct" model conversion attribution. Google Analytics now allows you to compare different attribution models to see how credit would be allocated. You can select up to three attribution models at a time and compare the results from each model in the table. In addition to the default models, you can use the Model Comparison Tool to create, save, and apply a custom model that uses the rules you specify. This allows you to tailor models specifically to the set of assumptions you wish to evaluate in your conversion path data. Click on the model drop-down selector, and choose Create new custom model. Use the Baseline Model drop-down menu to select the default model you want to use as a starting point for your custom model. The baseline model defines how credit is distributed to touchpoints in the path before the custom credit rules are applied. You can choose Linear, First Interaction, Last Interaction, Time Decay, and Position Based as baseline models. (Optional) Set Lookback Window to On to specify a Lookback Window of 1-90 days. (Optional) Set Adjust credit for impressions to On to customize how impressions are valued. (Optional) Set Adjust credit based on user engagement to On to distribute credit proportionally based on engagement metrics. (Optional) Set Apply custom credit rules to On to define conditions that identify touchpoints in the conversion path according to characteristics such as position (first, last, middle, assist) and campaign or traffic source type (Campaign,Keyword, and other dimensions). After defining the touchpoints you wish to identify, specify how these touchpoints will be distributed conversion credit, relative to other touchpoints. See the next section for examples of custom credit rules. Click the Save and Apply button to start using your custom attribution model. Note that the rules all specify relative credit distribution. First click, last click, even distribution between clicks, and U-shaped conversion attribution are available. The main difference is each click in the buy cycle gets a portion of the credit for a conversion. I prefer U-Shaped attribution that gives 40% of the conversion value to the first & last clicks, leaving 20% for the assisting clicks. On top of PPC & SEO conversion attribution, Convertro brings in offline conversions including TV, catalog, direct mail and phone calls to see how they influence digital campaigns. You can attribute conversion across multiple devices or multiple channels. Learn what is really driving your conversions and where you should be putting your budget. Regardless of what attribution model you use understand their limitations. Don't compare attribution across multiple platforms because they will never match up. Lastly, stick to one platform to measure success so the delta stays the same as you compare performance over time. We make changes to our Google Adwords account multiple times a day. Multiple people make multiple changes on our Google Adwords account multiple times a day. Did your campaign or ad group take a sharp turn downward? Want to know why CTR dropped? Google now gives us the option to see change history right in the grid. How Do I See these Changes in the Grid? Add columns for Budget changes, Bid Changes and many other changes to understand if a change you made to a campaign during a specific date range has caused a change in your campaign. All Changes - Shows the number of changes that have been made to your campaigns or ad groups during your selected date range. Budget Changes - Shows the number of budget changes, such as changing daily budget, that have been made during your selected date range. Isolate budget changes on the campaign or ad groups to see if you raised or lowered budgets. Is your campaign capping out? Want to know what the budget was 30 days ago? Now you have the answers thanks to Google Adwords. What it’s not: This column does not show changes to shared budgets. Bid Changes - Shows the number of bid changes, such as Max. CPC bid changes, that have been made during your selected date range. Isolate bid changes to see if the performance of a keyword has been influenced by recent changes in bid. Is your click-thru rate down and you want to see if you changed your bid recently? Keyword Changes - Shows the number of keyword changes, such as adding or deleting keywords, that have been made during your selected date range. Did you forget whether you deleted a keywords or when you added a new keyword? Google can help answer this question. Status Changes - Shows the number of status changes, such as pausing keywords, that have been made during your selected date range. Did you see a drop in impressions and want to see if you paused a keyword? Targeting Changes - Shows the number of targeting changes, such as language or country targeting, that have been made during your selected date range. All of a sudden, did you see a spike in traffic and want to see if you added a new country to your targeting? 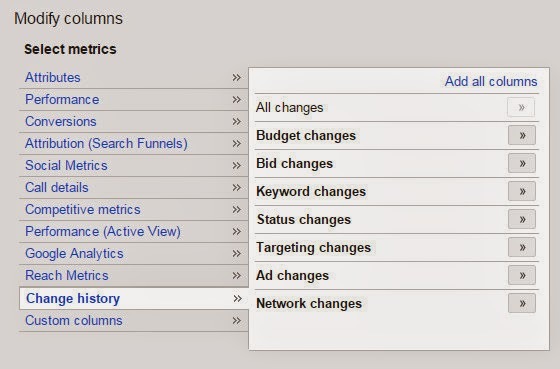 Ad Changes - Shows the number of ad changes, such as adding or deleting an ad, that have been made during your selected date range. Did Click Thru Rate drop and you want to see if you deleted an ad? Network Changes - Shows the number of network changes, such as adding Search Partners, that have been made during your selected date range. Did you see a reduction in Conversion Rate and want to see if you turned on or off Search Partners in the past? When do the Changes Show Up in the Grid? Changes made yesterday are displayed after 10am (PST) today. How Far Back Can We See Changes in the Grid? Changes made before May 19, 2014 are not shown in these columns. 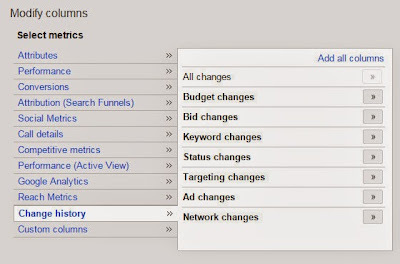 Historical changes are kept for 2 years in the traditional Google Adwords Change History log. Now you have a quick and easy way to isolate changes to campaigns and ad groups to see if a change you made during a specific period of time influenced your PPC results.